English cycling writer and author of Climbs and Punishment: Riding to Rome in the Footsteps of Hannibal. Felix has covered the major cycling races in the pro calendar for Eurosport for the past decade and finally took up the sport himself in 2012, at the ripe age of 31. 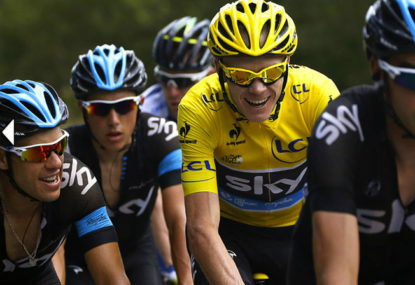 Chris Froome did not attend the presentation of the 2015 Tour de France route on Wednesday in Paris, choosing to forego the event in favour of a Team Sky get-together. Saxo-Tinkoff owner Oleg Tinkov courted controversy by inviting the world’s four top cyclists to go head-to-head over the roads of Italy, France and Spain next season. For one, victory was met with an overwhelming surge of relief; for the other, a pervading sense of disbelief. 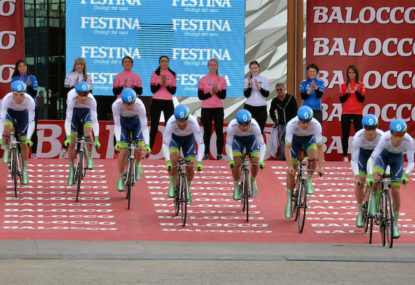 Some have branded the 254.8-kilometre course around Ponferrada in north west Spain as too demanding for the sprinters. Others have claimed it’s not hilly enough for the climbers. 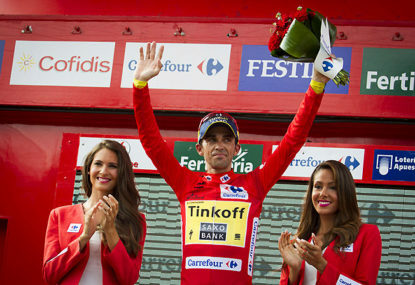 It featured the highest quality cast of all the Grand Tours, and the most thrilling general classification battle, but what else did we learn from the 2014 Vuelta a Espana? 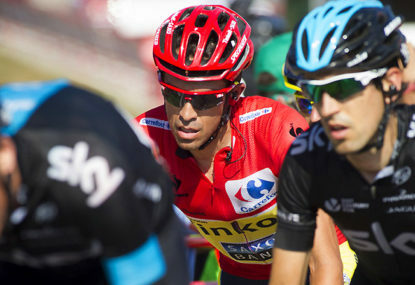 Alberto Contador did say that he would perhaps try and win a stage in the third week of the Vuelta a Espana – but few people expected it to be as race leader and in such swashbuckling style. After nine stages of gripping racing just nine seconds split first from fourth, as the high mountains loom in what is shaping up to be a classic edition of the Vuelta a Espana. On the crest of a wave following his Tour de France debut last month, Australia’s Zak Dempster entered the Arctic Race of Norway with high hopes of helping NetApp-Endura teammate Sam Bennett to a stage win. 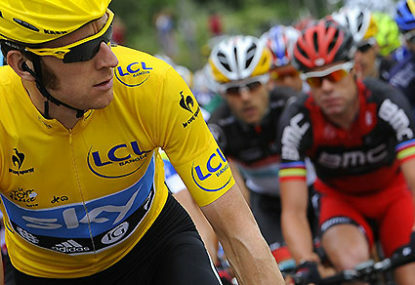 2014 Tour de France: Success or failure? For the fifth consecutive year we had a new face atop the podium in Paris – and this time, Italy’s Vincenzo Nibali was flanked by that recent rarity in pro cycling: two Frenchmen at contrasting poles of their careers. Just six days – and the small matter of the Pyrenees – separate Vincenzo Nibali from joining the pantheon of greats who have triumphed in all three of cycling’s Grand Tours. 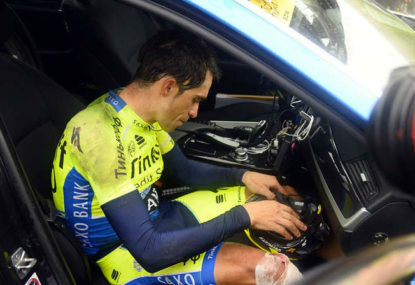 Alberto Contador became the second pre-race favourite to crash out of the Tour de France in less than a week – but that doesn’t mean the rest of the race will be a yellow procession towards Paris for Vincenzo Nibali. Kittel looks unbeatable, Cavendish only has himself to blame, while a glorious opening gambit to the 2014 Tour de France will make everyone involved in bringing the world’s biggest bike race to Yorkshire very pleased indeed. Sitting down for a Skype interview with Greg LeMond for Eurosport this week got me salivating about the impending arrival of Tour de France, which starts in the north of England this Saturday. Abandoning the Tour de Suisse after his crash in Stage 4 is surely the final nail in Bradley Wiggins’ Tour de France selection coffin. 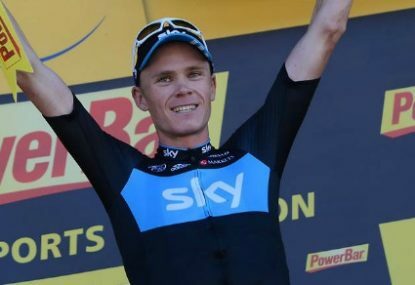 Why didn't we know about Froome's asthma until now? The way Chris Froome repeatedly attacked his rivals on the summit finish of the second stage of the Criterium du Dauphine left even spectators short of breath. As Franco Pellizotti attempted to return to the wheel of Mick Rogers near the summit of Monte Zoncolan, I wonder what Doctor Michele Ferrari thought about his two former clients going at it hammer and tongs? 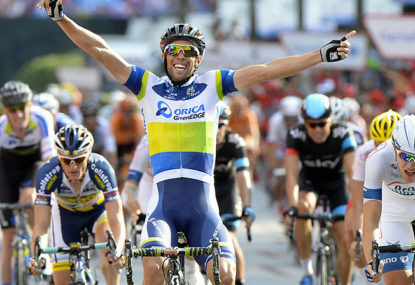 Veteran Mick Rogers kept the run going with his unlikely solo win on Stage 11, but for the most part the second phase of the Giro has been cruel on Australia after such a swashbuckling start. Evans above in Giro - but for how much longer? 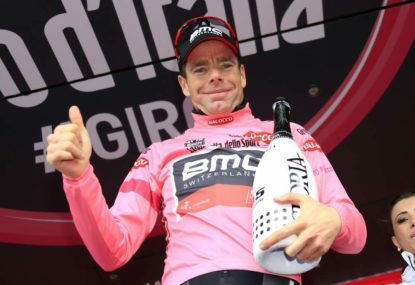 Cadel Evans enters the second rest day of the Giro d’Italia with a 57-second lead over his nearest rival in the overall standings. Recent evidence suggests that he’ll need a far bigger cushion should he still want to be pretty in pink come Trieste. As Michael Matthews heads to southern Italy with the maglia rosa safely covering his shoulders, it’s very much a case of a job well done for his Australian team during the Giro d’Italia’s three-day opening gambit in Ireland. Spot Froome taking it easy en route to Healesville today? Haha! Ha – I guess there’s our answer… Froome looking pretty strong, but happy to let Kennaugh continue his hot streak down under. Yeah, I think you’re right. It’s just not in his interest to peak now. And despite Cookson’s comments, this is still the earliest Froome has started his season for about six years. He’ll probably soft-pedal the prologue and have a little dig on Arthur’s Seat to test the legs – but I expect Henao and Kennaugh to be Sky’s protected riders. Thanks for the heads-up! That’s why they need to change the flag… too confusing when skimming over small thumbnails on start-lists! I was quite impressed, Andrew. At first I thought to myself, ‘that sounds quite like Cadel Evans, but he’s too coherent to be him,’ and then it hit home. 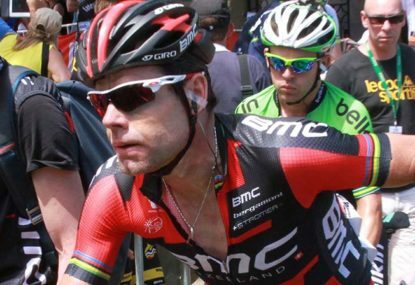 That said, I mentioned this on Twitter – that Cadel’s performance at least meant Australia’s men didn’t go away empty handed from the race – and some guy tore me apart. So I guess you can’t please ’em all. Sure, he was no Matt Stephens or Dan Lloyd when it came to high-brow commentary, but he certainly added something worthy to the pot – and was far better at speaking than when he was riding. Thanks guys – glad you like the piece. Thought it would be of interest – a little insight to what goes on behind, inside and in front of the peloton during a race. TV images over the weekend were quite majestic. If you check on my Twitter account, @saddleblaze, you’ll be able to see some that I took. Also on Instagram as well. Thanks Robhem. Superb win from Bennett – all the more so because he struggled on a rise 10km from the finish and told his team-mates he couldn’t do the sprint. Zak Dempster told him to full himself together – he took heed, got back in position, bided his time, then made the winning move. One very happy Irishman at the finish. Thanks chaps – the world’s an empty place this morning now that there’s no Tour to chew over and digest. What will we do? Lee would beat me in a fist fight, hands down. There’s no ‘mocking’ going on, Da Spoon, and the number of Aussie wins is immaterial – because I am English. Thanks for reading, though. Has Mark Cavendish lost his edge? Fair points – although I’m only rating Valverde when it comes to the Plan Bs of each of the main teams. It’s more than likely that he will finish higher than any of the Sky, Tinkoff or Astana riders who aren’t Froome/Contador/Nibali. Read on and you’ll see that I rate the French guys more than the Spanish veteran when it comes to having a dig at the podium. Pinot looks very sharp, in particular. Thanks for reading and your thoughts – you’re certainly right in that Valverde’s days as a bona fide Grand Tour contender are behind him. But he can still have a say on his day. Looks like Bouhanni may not race now following his crash in the French national championships… so that’s another fallen by the wayside. Cavendish put in a monster display in finishing second in the British championships – climbing solidly and almost taking the race to Peter Kennaugh. 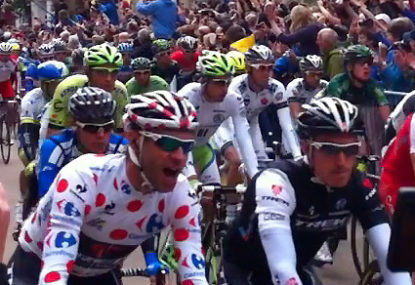 Perhaps Cav is the man to beat for green after all. 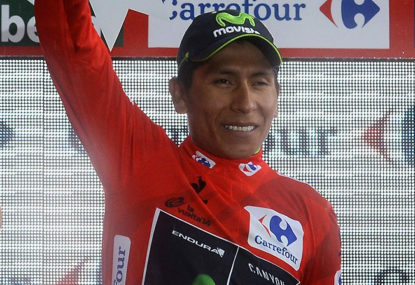 Now Kittel's out, who will win the Tour's green jersey? A follower of mine on Twitter, @SimoneWarner, also made this very astute point: this year was the first time since GreenEdge started out that the team has failed to win any medals at the Aussie national championships – both the road race and time trial, and both men and women. Food for thought! Sound advice and opinions, Wombat. 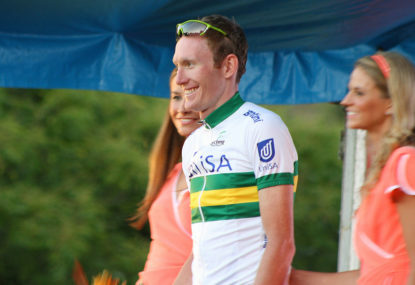 It’s fair to say that Meyer probably hasn’t lived up to his expectations, but his 2011 TDU win did all come down to a break – a mini Echappee a la Walkowiak, if you will – and so it would have been unfair to expect glory merely because of one ochre jersey. His problem, to me, is that he’s a jack of many trades, master of none. Pretty solid across the board, but don’t stand out on any terrain, and finds it hard to sustain his level over three weeks. As such, I can’t ever see him becoming anything more than a domestique or lieutenant. But he can still do a job, for sure. I think you’ve hit the nail on the head, Omega10. 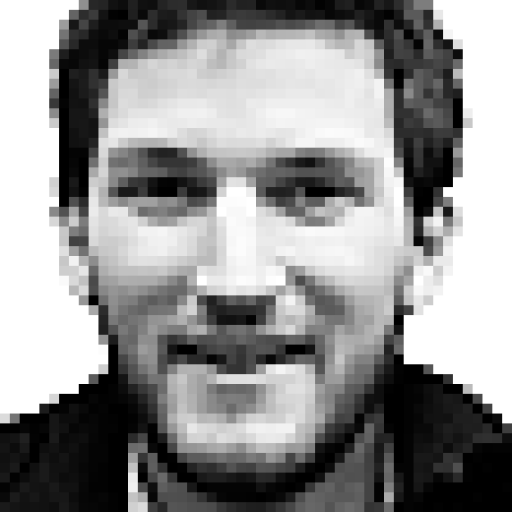 Interesting fact about Michael Wilson – he was actually christened Micheal because his parents mis-placed the ‘e’ before the ‘a’. It’s but one of the small anecdotes in my book, Climbs and Punishment – Riding to Rome in the Footsteps of Hannibal, in which Wilson makes a cameo by dint of his stellar win in Cortona in 1982. 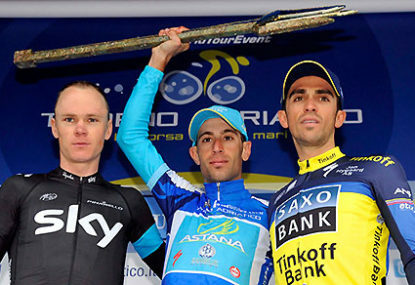 And you’re right – he rode in the Tour, twice in fact (I overlooked that in a comment I made earlier – apologies). Is this Australia's Tour de France team of the century? John, you make a great point and it was a huge oversight on my part. Hence the apologies and revised choices – see below! There’s no denying his place in the pantheon of Australian greats, mind. But like his compatriot Micheal Wilson (who excelled in the Giro in the 80s) his best performances came outside the Tour. (In Wilson’s case this is certain, for he never even rode the Grande Boucle). Interestingly, I wrote a similar – but more historical – piece for my Eurosport blog one day later and made a couple of tweaks. Having slept on it, I’d made some more changes – swapping Baden Cooke for Simon Gerrans and then drafting in Oppenman as team captain. Think you may have missed the part about doping, which makes O’Grady, Stephens and Hodge ineligible. Peiper rode five Tours and completed three. He was solid if unspectacular – a possible for the domestique role, but competition was too high! Konig’s progression will be very interesting. Sky don’t have a great track record with their ‘second tier’ riders – just look at how the likes of Uran, Cataldo and Boasson Hagen have struggled, even Cavendish, because of the GC ambitions of Froome and Wiggins. Konig, Porte, Roche – these three could be domestiques deluxe for Froome in the coming years – and hopefully the Czech will get his own chance to ride in some races. De Marchi has been very impressive the past few years and it was great to see him get a stage win in the Vuelta after all his tireless attacking in the Tour. That said, riders often stagnate once they arrive at BMC – although De Marchi’s lack of rainbow stripes might make him the exception to the rule. I’d have included both Konig and De Marchi in this list had I more time and space. They are clearly more exciting transfers than that of Adam Blythe, but Blythe’s move involves GreenEdge and Goss and so I thought it would appeal to the Australian readership. Cheers, Tony. All the best. And some quotes from Porte, who was speaking to the Examiner: “It’s not every day you get a Tour de France champion coming down to race in Launceston. For me, having been friends with Stan Seijka, it’s massive to have Chris Froome come down and race. For me, that’s the big thing. Stan would have been proud to have this race in his honour. “He’s keen to see as much of the world as he can and obviously I talk a lot about Tasmania and the fantastic training opportunities we have here. I’ve seen a fair bit of the world myself now and I still think we have the best terrain to train on in the world and I’m looking forward to having him around for a couple of weeks and sharing it with him. I’m sure I’ll show him the Scottsdale loop, Poatina Hill and the East Coast and it will be nice to mix it up with some mountain biking and maybe get out to Hollybank.